Untouchable Fictions considers the crisis of literary realism- progressive, rural, regionalist, experimental- in order to derive a literary genealogy for the recent explosion of Dalit ("untouchable" caste) fiction. Drawing on a wide array of fiction from Premchand and Renu in Hindi to Mulk Raj Anand and V.S. Naipaul in English, Gajarawala illuminates the dark side of realist complicity: a hidden aesthetics and politics of caste. How does caste color the novel? What are its formal tendencies? What generic constraints does it produce? 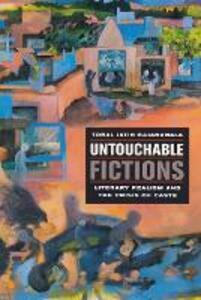 Untouchable Fictions juxtaposes the Dalit text, and its radical critique, with a history of progressive literary movements in South Asia. Gajarawala reads Dalit writing dialectically, doing justice to its unique and groundbreaking literary interventions while also demanding that it be read as an integral moment in the literary genealogy of the 20th and 21st century. How might we trace the origins of the rise of Dalit fiction in the critical "realism" of the Progressive Writers Association of the 1930s, or in the gaps laid bare by the peasant novel of the 1950s? And what kind of dialogue does "untouchable caste" writing with its more famous counterpart: the Anglophone fiction of the last few decades? Under Gajarawala's lens the aesthetic languages of Hindi and English are intertwined and caste becomes a central category of literary analysis. This book, grounded in the fields of postcolonial theory, South Asian literatures, and cultural studies will be important for all readers interested in the problematic relations between aesthetics and politics, between social movements and cultural production. Engaged as it is with contemporary theories of realism and the problem of aesthetics, it would also be of interest to students of English, comparative literature, contemporary Third World literature, and historians of literary movements. More specifically, as a text that considers recent developments in genre theory and South Asian fiction, it would interest scholars of the Indian and Indian Anglophone novel. Finally, this project, as an interrogation of caste politics in the cultural sphere, is an important contribution to the burgeoning field of Dalit studies.